Video blogging — or vlogging, as it is more commonly called — is on the rise. That’s because bloggers and Internet marketers are waking up to the world of difference that video is offering for their online marketing business. As you may already have heard from the Video Boss himself, Andy Jenkins, video makes more money than anything else these days. Why? Because video engages more attention and demonstrates more content in less time. And video seems to add legitimacy to any business. Apart from that, video has lots of other advantages. Some of you may not be aware of it, but video is good for SEO. In fact, for many search results nowadays, good ol’ Google includes a couple of videos in the very first page of its search results. I think we can safely say that Google — and Bing and Yahoo! for that matter — loves videos. Another essential thing to know is that video is good for a site’s bounce rate. Why? Since highly informative and entertaining videos are extremely engaging, visitors to the site tend to stay longer, and they move from one video to another within the domain, if they’re available. Clearly, video blogging can do more for your current Internet marketing efforts if you’re not doing it yet. So how does one set out to create a successful vlogging campaign? Begin with your goal firmly in mind. Before you set out to produce every single one of your videos, the most efficient and time-saving thing you can do is to plan ahead. The things that you want to achieve with your video blogging campaign should be very clear in your head from the start. What do you want to achieve by using a video blog? Is it to increase traffic? Expand your subscriber list? Boost sales? Reach out to a wider audience? Knowing what you want will inevitably guide your choices for vlogging content. Nothing sells an idea or a product better than an emotionally-charged story. That’s because emotions drive people to take action. Study how to create powerful scripts or story lines for your video blogging campaigns. Also remember that compelling stories make audiences crave to see more, so effective vlogging will keep ’em coming back. Optimize your videos for the keywords that your campaign is targeting. For best results, upload your videos on YouTube, because YouTube is the most-visited video site on the Internet. Of course, nothing should stop you from distributing your videos to other video-sharing sites, such as Vimeo, Videofy, and Veoh. The areas of your video that you should optimize for keywords you seek to target include the title, the description, and the tags. Especially if you’re vlogging about a time-sensitive issue, you’ll want to post your video on your blog right away and let your subscribers know about it as soon as possible after that. It’s a great idea to use video along with a subscriber list so that when a new video goes up, you can broadcast it immediately to your list. You should also broadcast your newly-produced video to social sharing sites such as Facebook, Twitter, Pinterest, and StumbleUpon. If you are new to video blogging, it may take a while to learn these and outs, but as you progress and get used to the process, it will become a way of life for you. And you’ll soon reap the rewards that video marketing has in store for your marketing campaigns. One of the best ways to improve your online marketing campaign is to take advantage of video blogging. 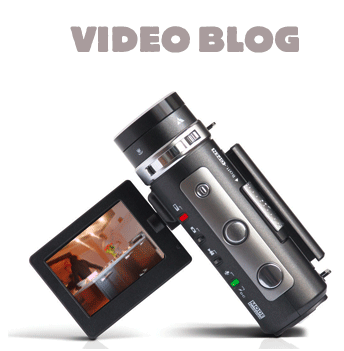 For help in setting up a video blog for your business, contact us today.